The following is the biblical background for this Feastday. ~ The Annunciation has always been celebrated exactly 9 months before Christmas. ~ The Feast of the Annunciation is not a Holy Day of Obligation (days when Catholics are obligated to attend Mass). ~ 25 March, in Western Countries, used to be the 1st day of the New Year, until 1752 when secular calendars used 1 January as New Year's Day. ~ This day was also called "the Feast of the Conception of Jesus", as well as "the Feast of the Last Judgement". This was the day when Mary said "yes". This was the day that Jesus became flesh in her womb. This is the day when one of our most beloved prayers began: "Hail Mary", which begins, "Hail, Mary, full of grace, the Lord is with thee." 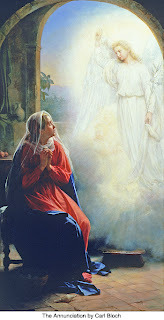 The Annunciation is also the first Joyful Mystery of the Rosary. Could you imagine if this happened in modern times? Would it be a reality show? Would God find someone to say "yes"? Would this happen in the USA or somewhere else in the world? Something to think about, for sure. This is how I imagine Mary to feel; she has a scared look about her. She must've been terrified when she first saw the angel, only to be comforted knowing that God would be with her. It's just unimaginable, but I guess that's what faith is all about, right? Mary, thank you for sharing the traditions of Lent! If you get a chance to do so, check out the Lenten Dissent poem at writersalmanac.NPR.org today. I almost spit out my coffee because it was so funny. Do not fear, it does not bash tradition or Catholicism. 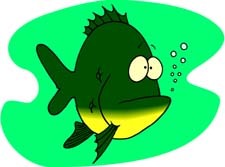 On the contrary, I suspect Catholics will find it funnier than non-Catholics....plays into meatless Friday perfectly. I am eating meat today. Had a left over salad from last night with chicken that would be yuk tomorrow. And since we are allowed to eat meat today, I am! What an interesting post. Thank you! I hadn't a clue about the calendar change from March 25th in 1752. Yes, I think it's all about faith! Thanks for the education. I didn't know much of this. A church we belonged to many years ago did (and still does) a thing called The Living Christmas Story. There are numerous sets of scenes from the Bible. The entire church grounds are set up so that people can drive through and it's like being back in Bethlehem during the days when Jesus was born (costumes, animals...etc.). 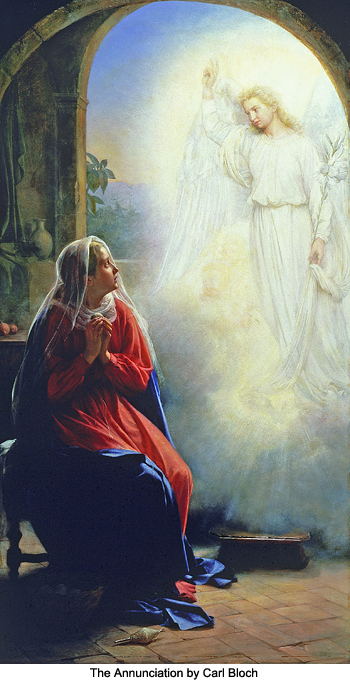 There are several prominent scenes, and the very first one is the Annunciation. Members of the church play various roles (all silent actors), and I had the honor of playing Mary in this scene two separate years. The second year, I was pregnant with my son...barely showing, if at all. It was so incredibly magical and personal for me. Would anyone believe Mary. Anyone. Sometimes I think we've gotten to the point we wouldn't recognize Jesus coming. Sad, but maybe true.